©Barry Sandland/TIMB – Bus and car in the safety zone that is supposed to be for bikes. 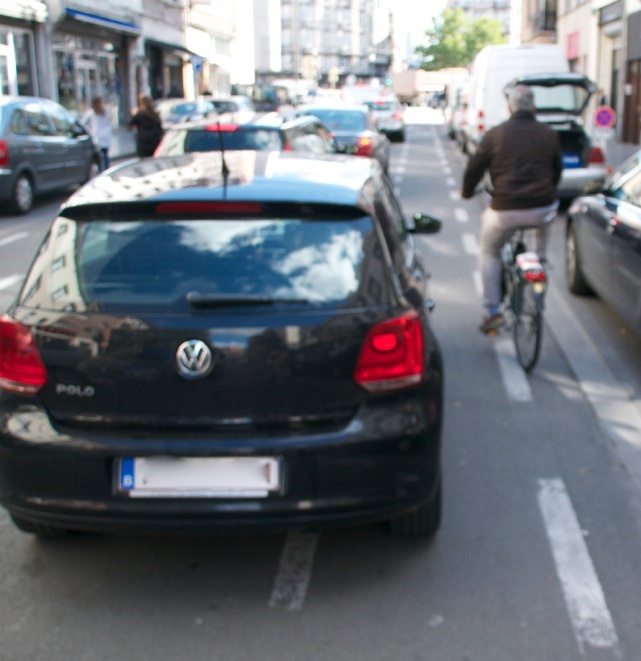 It is not hard to see this every day in Brussels, as cars encroach on what should be a safe space for cyclists. In the latest salvo, cyclists are presented as, again, a mass of law breaking, uncaring, unlicensed vehicles who are never held into account for their behaviour. ©Barry Sandland/TIMB – Cyclist has to edge past a car that is using the bike lane for even more space. The day after I read about this debate, I went for another short spin and saw; a half dozen cars double parked in the bicycle lanes, forcing cyclists out into more dangerous traffic; at every stop light with a cyclist zone at the front, cars using the space to get that extra edge forward; oncoming cars passing parked cars (double parked in the bike lane) and coming directly at me, using part of the oncoming bike lane for their trajectory; cars on my left coming into the intersection refusing to cede right of way to the vehicle on their right. That would be me on the bicycle. Once I was pushed into the curb. And, countless times, car after car using the bike lane as part of their roadway making it impossible for cyclists to use the space. This was all in one day in a ride done in under an hour. This is an every day collection of events while riding in Brussels. I can go to any city quarter during the morning and evening runs to and from work and get the same result. I have ridden my bike for 16 years in Belgium and in all that time I have never seen a motorist given a ticket for any of these offenses. Never seen a motorist given a warning. Never seen a police officer raise an eyebrow of concern. Meanwhile, I have been knocked from my bike twice, driven into a curb a dozen times, too many times to count I have been cut off at intersections by cars turning right directly in front of me, and squeezed into dangerous predicaments by overtaking cars who think the most important issue for them is to prove they can get their car in front of a cyclist. That has happened hundreds of times. And, when they miss me, I have managed to laugh at drivers who rev their engines, race past, only to have to brake suddenly as they realize they are about to rear-end the car in front of them, their obsession against two wheels having overwhelmed them. I slip past seconds later and disappear up the road while they remain in gridlock, both physically and mentally. Meanwhile, as we search for that horde of dangerous cyclists, In the past week, I have stopped my bike on pedestrian walkways, ridden on sidewalks and gone through red lights. And I will do it all again. I will pull up in front of a queue where a car has taken the “safe” bike space and then force my bike into whatever space remains. That might mean my front wheel is now on the pedestrian crosswalk. On occasion, if I feel the motorized traffic is so uncaring to my presence, I will slip onto the sidewalk and ride up a dozen or so meters just to get back to a free space, rather that then getting crushed by the car alongside, blindsided by the car behind, or struck by the impatient overtaking driver in the oncoming lane. I have come to lights and felt cars edging closer and closer to me at the light, trying to get alongside, get their dominant position. I will go through the red light, if safe, and get a few dozen meters on the physical threat that is too present, get into the slightly distant, crawling traffic lane ahead and find some cautious shelter riding alongside this moving metal shield, in a narrow and narrowing “bike lane” that I can use when car drivers do not want it for themselves. I will get to some lights and see no traffic in the other lanes and, on occasion, ride through. When I come to a few areas I travel frequently, and know the driver habits, I prefer the sidewalk and will use the space for up to 100 metres rather than run the risk with drivers and their steel cages. I have rules. On a sidewalk, I will not ride faster than a person can jog. Usually slower. I often try and make a hand gesture of recognition to oncoming pedestrians, so they know I see them, know that I am aware. And I have never had a person tell me to get off the sidewalk. More often than not, I get a nod of understanding. I despise cyclists who treat sidewalks like their private bike lane, racing along the space, scaring pedestrians the same way cars terrify us on the road. But stop painting all cyclists as thugs and ruffians who are beyond reproach. That is just scaremongering. Antwerp’s pseudo-safety pundits who claim that cyclists are beyond reproach are just the last hurrah of a car-centric clique who refuse to allow a decent road environment to happen. They would have the world think cyclists are just as dangerous as cars, just as irresponsible. In a recent study in Australia, cyclists were equipped with on-board cameras. The results showed cars were responsible 87% of the time there were dangerous car-cyclist events. There are hundreds of videos on YouTube showing the sort of dangerous driving that is keeping cyclists from the roads. And any person, including those with a badge, can watch a traffic light and see car after car stopping in the bike space, rather than in their designated space behind. I will give the point that motor vehicle drivers are less likely to actually threaten and intimidate an identifiable police cyclist. Car drivers are not that stupid. But the police do nothing to stop drivers from intimidating cyclists, taking designated cycling paths as de facto car lanes, pressing past cyclists in a desperate attempt to prove, for just 10 meters, they were able to be faster than two wheels. 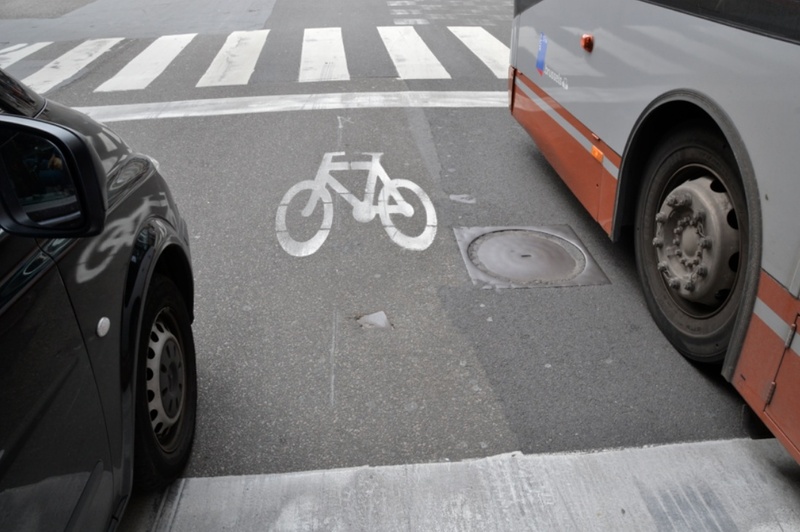 Antwerp, and the rest of Belgium, have to start taking care of cyclists. Make the roads safer for the flesh and bones users who are risking life and limb within these selfish, petrol fume smoking idiocies. The police could start with something simple. Start ticketing cars parked in bike lanes. Start ticketing drivers who use the bike lanes as their access. Frankly, I would be happy to see police pull cars over just to give abusive drivers a warning and a quick instruction on the limits of a car’s right of way. But I am also happy to see them stop cyclists who are racing on sidewalks, or idiot cyclists who ride through busy red light situations. While you are at it, do something about the ATVs who race the same roads, at the same time of day, week after week – but apparently the police simply do not know what to do. It really is not that hard. Start enforcing the rules of the road and the rights of cyclists instead of looking for another reason to justify why a driver had to make a bike frame a hood ornament for an outdated gas guzzler. Meanwhile, when I ride, I will continue to not trust any motor vehicle on the road. I will expect any excuse to be made if I get hit by a car so the driver will simply walk away. These are the lessons I have learned only too well. 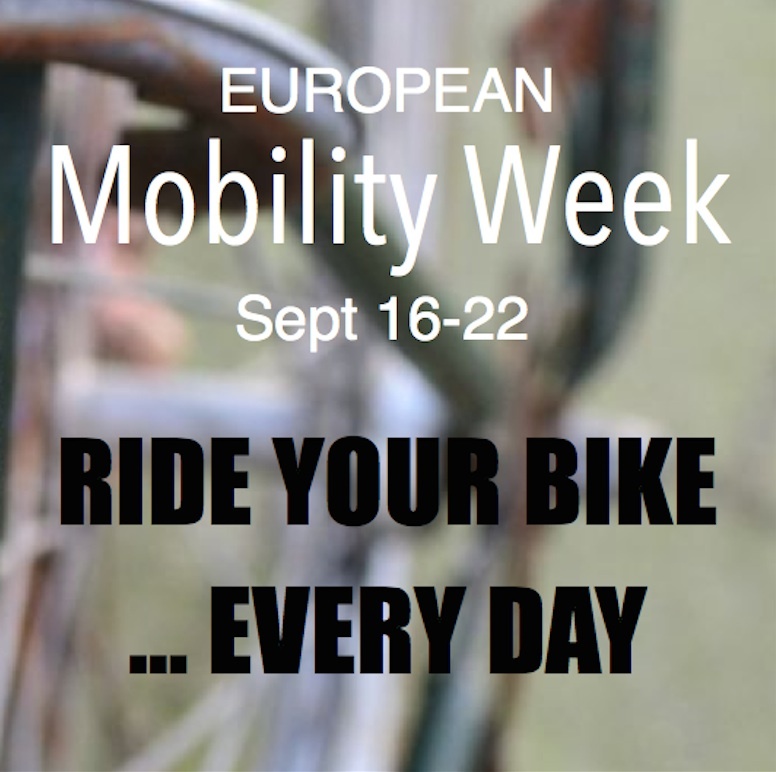 This entry was posted in advocacy, Belgium, Brussels and tagged Mobility Week. Bookmark the permalink. ← And so what if you are injured?